Thank you for the interest shown in Schiedel ISOKERN. Our complete homepage is only available in Danish, but this does not mean that we are not interested in doing business elsewhere in the world. On the contrary we are already exporting to approximately 10 countries and we would be pleased to increase our activities abroad! Schiedel leads the market in flue-ducting, integrated stove and ventilation solutions and creates technically advanced, design driven products to improve the living environment. Our thoughts and actions are value-based. We provide entrepreneurial excellence based on absolute reliability and friendly helpfulness. Our open corporate culture forms the working basis for our employees, making it the foundation of our long-term success and our excellent reputation in the market: no matter if it comes to architects, planners, builders or the end customer. With high quality products, timeless design and the highest energy efficiency, we want to increase the value of homes and increase the comfort of living and quality of life of homeowners. Please find a brief introduction of Schiedel ISOKERN below: Who we are, our product range and the raw material enabling us to offer you unique products. Please feel free to download our international customer magazine, “ELEMENTS”, right here. As we do not produce a product-catalogue in English language, you may refer to the catalogue of our colleagues in UK. Please note, however, that not all products contained herein, are manfactured in Denmark. It is a 100% natural, CO2 neutral and environmental friendly material with a density of only 390 kg/m3 (the raw pumice material). Due to various recipies the density of the finished pumice block stone varies between 750 to 850 kg/m3. The density for leca is 220 kg/m3 (the raw leca) and app. 1,100 kg/m3 for the finished leca based block. The reason why the finished leca blocks are considerable heavier than pumice blocks is primarily due to the sand in the leca mix. Pumice is very durable when exposed to high temperatures (+ 1,000 degrees), and does not crack, even when the temperature suddenly goes up. The finished pumice block stone product is even very easy to process and to build/assemble. When used indoor the big fireplaces are approved with a distance of 7 cm and the small ones with a distance of 10 cm to flammable materials. 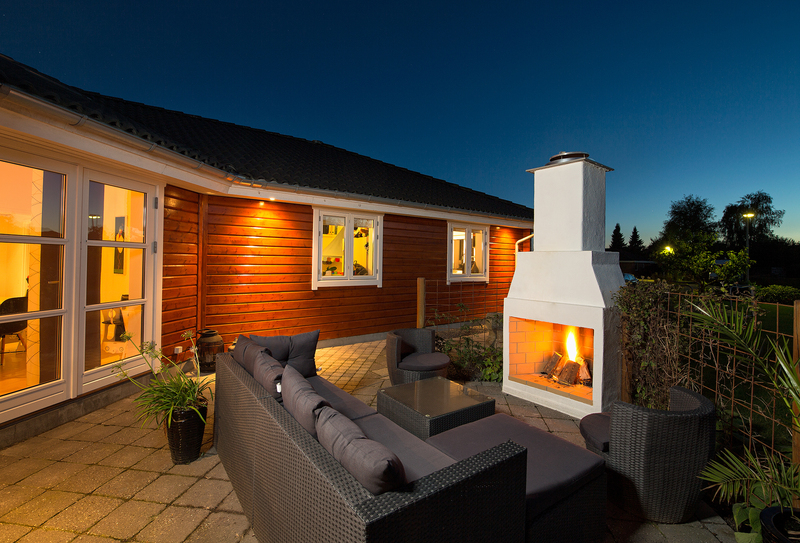 The Kingfire Nordic on the photo to the right, unites friends and family on late evening get-togethers in front of an open fire. This is where you never want the night to end! 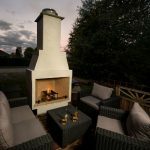 PerfectFire Nordic is a complete solution where the insert is built into a frame of pumice, on which the chimney is placed. The frame is so sturdy, that it will easily carry the complete chimney. The material is exactly the same as is also used for chimneys for, e.g., large-scale hay furnaces and has been tested at temperatures of 1000 °C +. The total solution can be placed at a distance of 0 cm to flammable materials. With a PerfectFire Nordic, you can place your fireplace, completely independent of access to combustion air and roof construction. The solution goes from floor to roof and is adapted as needed. That way, you get the clean lines and elegant design that characterises the Nordic home. We also have the product range to offer the stove dealers a possibility to build customized pumice frames. For the customized frames, the dealers could use inserts from whatever manufacturer, they work with. Basically, the advantages with this solution are the same as for PerfectFire Nordic, except for the fact, that the dealer will have to do some cutting, customizing the frame to the specific insert. Schiedel ISOKERN is offering a system similar to the PerfectFire Nordic to manufacturers of inserts. In such cases, we would adapt the pumice frame to the desired inserts from the manufacturer. This is a brilliant way for the manufacturers of inserts to differentiate their products, and enabling them to enter new segments of the market.